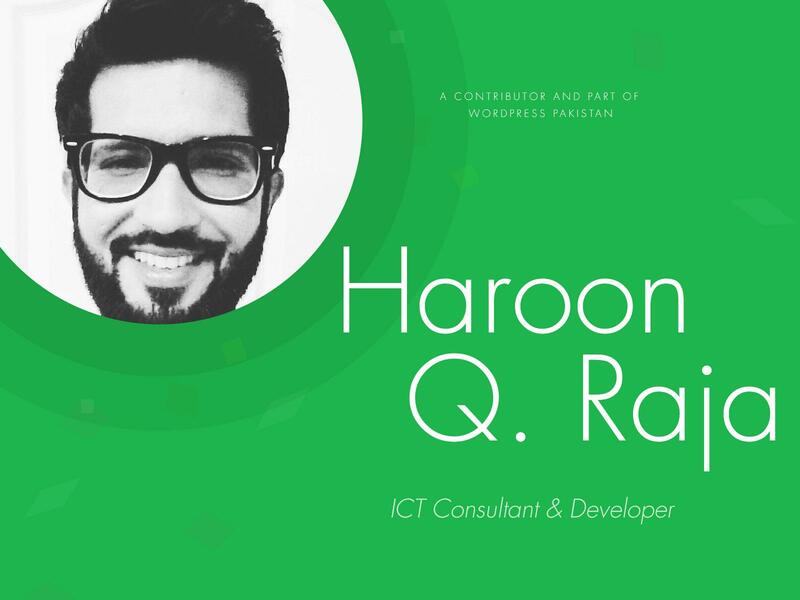 Haroon Q. Raja, I’m an Information & Communication Technology consultant with a decade and a half of experience in development, design, deployment and management of both out-of-the-box as well as custom-tailored software and communication solutions. Over the past few years, I’ve also written for some major local as well as international technology publications including Mobile Nations, XDA Portal, and AddictiveTips. My educational background in Software Engineering, Economics & Finance, and Mass Communication. While I eventually dropped out of all three of these degrees, pursuing them proved to be quite a valuable experience by equipping me with a versatile foundation in these disciplines that are closely interrelated in today’s’ ICT landscape. My first encounter with WordPress happened when I had the opportunity to take over the website of the college where I was studying my BSc in Economics & Finance and teaching Mathematics to A-Levels back in 2006, and I have never looked back. It has been a decade starting with intrigue-turned-into-fascination, leading to a lot of experimentation, taking on projects as the opportunity came by and learning how to build them in the process after taking them on, and even after all this, I still feel like I’ve only scratched the surface. Currently, I’m in the course of setting up a full-service digital agency offering end-to-end website development, administration, management, content development, and marketing services. Also, I’m also (finally) hoping to launch my digital publication this year, targeted at the modern urban geek. I have been helping others on and off with several open-source projects in their IRC channels and occasionally on some forums, and the experience is always quite fulfilling, this time, included. It simply feels great to contribute to a community that has helped you a lot of your career without expecting anything from you in return. A lot of what I’ve learned so far in my career wouldn’t have been possible without all the help I’ve received from volunteers, and it’s only fair that I try to carry on in their footsteps. Professionals like me wouldn’t have been where we are if it weren’t for all the helpful members of the community who kept on guiding us whenever we got stuck. It’s the spirit of a community that makes open-source software the greatest thing on earth since sliced bread. If you’ve learned from them, don’t hesitate in passing the torch. And even if you don’t feel like an absolute expert, don’t let that keep you from passing the torch; there are plenty of novices out there seeking advice that even someone moderately proficient with WordPress can easily offer, so don’t hesitate in passing the torch. I would like to thank the WordPress Foundation, WP-Pakistan, and the developers of all those amazing free (as well as many premium) resources out there, and all the members of the community who have helped me whenever I’ve been stuck. Keep up the great work. We’ve come a long way to powering 25% of the web; let’s make it to 50% together! I am looking for a wordpress developer to improve my website’s performance etc. Can you or any of your colleague developers help me with it?